Jordan Spieth reacts to his putt on the 18th hole. Saturday afternoon, a man will be standing around the scoring tent at Aronimink Golf Club. You won't know him. You don't need to know him. He won't advertise his presence. He just won't lack for company. "Players, caddies, wives, agents,'' Tom Alter said of who is likely to stop by for a chat. Their questions to him after the third round of the BMW Championship will be brief and specific. Where do they stand? By the end of this tournament, a year-long FedExCup points competition will be whittled to the 30 best-of-the-bests who will compete in two weeks for the Tour Championship and also a $10 million bonus for overall points leader. Yes, $10 million will make players and caddies and wives — and most certainly agents — pay attention. Call it a different kind of FedEx tracking, trying to locate a most valuable package. Like always on the PGA Tour, someone is going to win this tournament, but the entire 70-player field also look at this different leaderboard, trying to be among that top 30. The 70 here already are survivors, since 125 of them qualified for the first week of the FedEx playoffs and 100 more moved on to last week's tournament in Massachusetts. Then 70 advanced here. Not the top 70 there — points were accumulated all year, with higher point totals added for these three playoff events. That Jordan Spieth has never missed a Tour Championship while on tour doesn't change the fact he's sweating this out right now. Spieth began this tournament in 27th place. 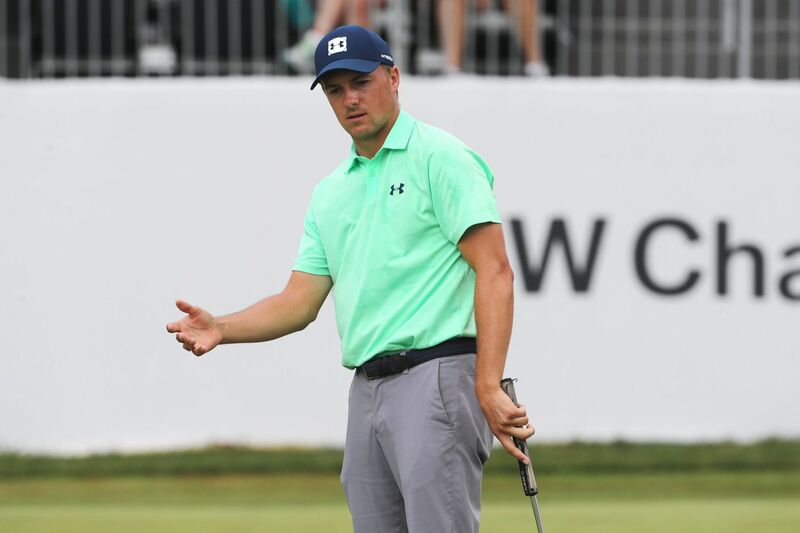 As he was faced with a five-foot par putt Friday on the eighth hole, Spieth had slipped to 30th in FedEx points, last man in. The putt missed. Spieth immediately slipped to 32nd place. A double bogey on 11 and bogey on 12 pushed him farther back to 34th. A couple of birdies brought Spieth back to 32nd, but it's going to be that kind of roller-coaster weekend for him. Keegan Bradley, now tied for third at 10-under after a second-round 64, has that top 30 on his mind. Bradley has made one of the big moves of the week, from 52nd starting out to 28th now, just inside the bubble. What does Bradley need to do to get to where he wants to be? "I probably need to shoot this again, I think — maybe more, who knows,'' Bradley said. Tournament leader Xander Schauffele has jumped from 41st to sixth place. Alex Noren, tied for third, has gone from 50th to 25th. Gary Woodland has shot 66 two straight days. Woodland started 30th and remains 30th, which suggests he might need another 66 or two to squeeze in. The FedEx Cup leaderboard at the BMW Championship. Don't think any player of any stature is ignoring all this. Rory McIlroy's agent had a good conversation with Alter before the playoffs about the ramifications of skipping a playoff event. McIlroy knew he had to perform here and has, his 9-under, 36-hole total placing him 20th in FedEx points, after he started out 24th. Alter had a conversation last week with Tiger Woods' caddy, Joe LaCava, about the lay of the land. Despite a first-round 62 that had Woods as co-leader, an even-par second round means he has actually dropped from 25th to 26th this week. His weekend rounds remain crucial. "I think Tiger knows,'' Alter said. Tiger Woods lines up a putt on the 18th hole. The only person who doesn't have to worry about any of this at Aronimink is Bryson DeChambeau, since his wins the last two weeks in this FedEx Standings assured that he will go to the Tour Championship next week in Atlanta with the most points. Anyone in the top five after Sunday (halfway through, that's DeChambeau, Justin Rose, Justin Thomas, Tony Finau and Dustin Johnson) can get the $10 million bonus by winning in Atlanta, regardless of what anyone else does. All 30 players will have a shot, but the other 25 will need help. Alter will be at his station this weekend explaining ramifications to anyone who wants to know, but he doesn't reach out to any golfers himself. "I don't want any player to think I'm getting in his head or something,'' the standings guru said.